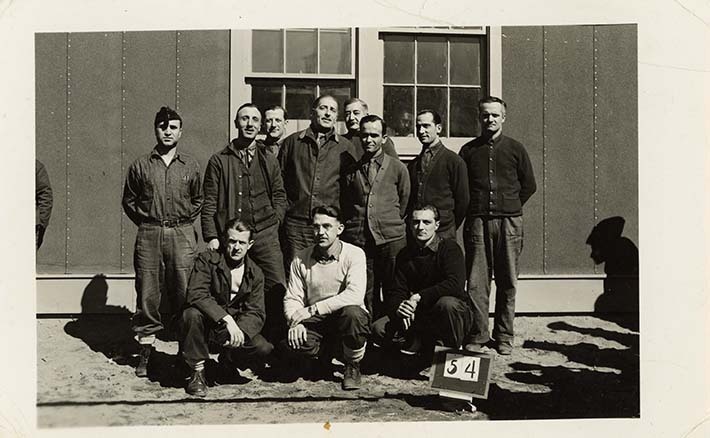 Photograph of 11 internees; three are crouched in the front. All seem to be wearing heavier clothes suggesting the picture was taken in early spring or in the fall. An identification card reading "54" is positioned on the ground in front of the internee at the far right. The group is positioned in front of a building. Photograph is undated, but given its resemblance to other pictures (see DICEA2011.0001.0032 or DICEA2011.0001.0010), it was likely taken in Fredericton Internment Camp, where the remaining Italian Canadian internees were transferred in July 1942. The identification card used suggests it was a formal picture taken by a government official. This photograph belongs to a collection owned by Italian Canadian internee Ruggero Bacci, standing first from the right. Gino Tiezzi is standing next to Bacci, on the left. Donato Sansone is standing to the left of Tiezzi. The individual crouched first from the right is likely Giuseppe Frascadore. The iinternee standing first from the left is likely Antonio Di Pietro. A duplicate print of this image is held in the ICEA collection (LDICEA2010.0001.0004). This image held by the Archives of Ontario seems to have been erroneously dated to June 1942.